Arthur merchandise is such a weird thing, because you never hear about it or see it, yet a quick look online shows that there is so much of it. So I've been wondering, what (if any) merchandise does everyone have relating to the Arthur series? For me, due to the rarity of finding it, I don't have much of anything that isn't out of the book/video range. Re: What Arthur merch do you have? Just the way you said that made me laugh. What is "Arthur's Really Fun Day"? It is a page already; I made it. Oh wow...I somehow missed that page creation. It's actually Arthur's Absolutely Fun Day! there used to be some cheap canned spaghteeios type of food sold in Montreal at Metro stores. It was a horrible looking can and had pictures of the Arthur characters on the label. I thought it was really in bad taste and wondered who ever had the insane idea of putting a monkey character on a can of some unrecognizable food product. Like a can of monkey meat. I once bought a can but never had the nerve to open it. I have the usual plush dolls that came out early on but the one thing I really liked was my key fob. I'm not sure if they were ever mass produced. It looks like crap now but it's been well used. Not too bad in my opinion, but could of been better. There is a story behind behind the lack of merchandise on Arthur. The series started back in the days when licensing generally made the lions share of the revenue of a an animated series and considerably helped pay for the production of the series. At one time entire series were made such as Popples or Care Bears or GI Joe because the toys made more money than the series cost to make. It didn't matter how much you made from broadcasting as long as it got on air and sold toys. The big production companies like Cinar and Nelvanna had departments of people that managed licensing of the characters from the series and it was big business. Caillou made tons of money for Cinar. 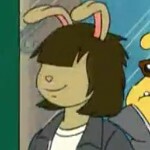 In the case of Arthur there were 3 parties involved producing the series. WGBH Cinar and Marc Brown. In the deal to do the series Marc held out on keeping all licensing as well as publishing of books. Cinar had the rights to make money on non American sales of the show ie. UK and Australia east Europe and WGBH held the US sales of the show on PBS and some video release sort of stuff. Each party paid the other a percentage of money made in their part of what they owned. A money making marriage made in heaven right? Cinar tried to get Marc to use the inhouse department for his licensing that was already set up and had worldwide contacts to do the licensing of Arthur for companies that wanted to make merchandise in exchange for healthy percentage and not have to do the work and his profit would have been huge. Marc was running the merchandising business out of his garage and using his neighbours to do the work. They made a bunch of poor quality things like paper party plates and hats and the can of monkey food that I described and also some good quality plush toys that Cinar had a relationship with the manufacturer of. Licensing for the most part is looking at a lot of prototypes from companies in China and Korea and letting them know how much you will charge them to let them make it. As well you have to get them to make changes so it's on model(unlike my key fob) and provide them with the proper fonts and color references and even drawings and designs to use on the product. It's a job that just takes full time work. Otherwise you get some really ugly off model stuff as you can imagine some guy in Bangladesh might draw having never seen the show and getting paid 10 cents a day. About 2 years into production on the series when Arthur was is in it's heyday Marc announced to the media that he was putting an end to Arthur. The press went crazy for a few days about the demise of the hugely popular series until he clarified that he was going to stop licensing the Arthur brand for merchandising. He said he did not want to go to garage sales in the future and see Arthur things for sale. So he stopped doing it. He also stopped any sharing of the profits that would have gone with it. Needless to say that did not bode well for future funding of the series or income for the 2 other partners. So yeah, that's why you won't see much merchandise. In hindsight however , licensing departments in major production companies were all disbanded because licensing fell apart. It died in the days with the lead paint in toys like Thomas the Tank Engine if you recall. Now only a very few shows have merchandise like Sponge Bob and Dora. You don't see merchandise anymore on every single cartoon show like you did 10 years ago. As I once heard from an executive at Cookie Jar. "Go to Toys R Us and look at all the empty shelves". It's true or at least it's a true as I can recall. There are almost no television series based toys from animation. Disney excepted but even they sell much less and it's mostly from the feature based series. Maybe that's too much information and off topic. If so let me know and I can try to rewrite this post more to the point. Wow so that's why not many were produced. It's not an easy business any way as some claimed it was back in those days. Now a days it no longer matters as it's rarely done anymore.